Style is one of those words that has too many meanings to keep track of. I once narrowly avoided attending a conference workshop on “personal style” when I found out that it was actually about clothing and makeup and such. Style as part of your appearance and branding. I had thought it would be about developing one’s personal writing style, which we often refer to as voice. 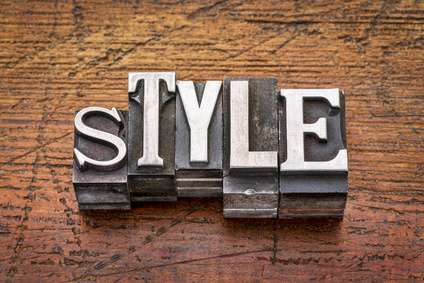 Yet another type of style—and this is what I actually want to cover today—is the kind of style we are talking about when we refer to The Chicago Manual of Style, The Christian Writer’s Manual of Style , or the Associated Press Stylebook. ☐ Style and format of the manuscript are in accordance with industry standards. Style covers things like what abbreviations are permissible and what terms should be spelled out, when to use numerals or words for numbers, and how to treat titles. I use the phrase “industry standards” because what is correct may vary depending on your chosen style guide. For example, AP calls for words for numbers up to ten, while Chicago uses words for numbers up to one hundred. You must know the appropriate style for the manuscript you are writing. Generally, books use Chicago and articles use AP, but if you are writing for a magazine, they may have their own in-house style guide. As I’ve said before, you don’t need to buy a copy of CMOS, but do have a look at it in the reference section of the library. Proofreading Secrets of Best-Selling Authors , by Kathy Ide, which I’ve mentioned before, summarizes the basics writers need to know about punctuation, usage, grammar, spelling, and style. It gives comparisons between Chicago style and AP for those who write both books and articles. The Christian Writer’s Manual of Style is for both novelists and nonfiction writers working in the Christian submarket. It covers issues like what religious terms to capitalize (or not) and how to format quotations from the Bible. I recommend buying this book if you intend to write extensively for the Christian submarket. Style also encompasses manuscript format. I sometimes hear writers complain that the format of their manuscript shouldn’t matter; it’s the content that’s important. Content is important, but so is honoring the request of the editor or agent you are trying to do business with. If they ask for standard manuscript format, give it to them. But one minute—usually more like two once you deal with the irregularities that inevitably throw a document out of whack when you change the format—spent on every single manuscript an acquisitions editor sees in a day, every day, adds up to a lot of time. These folks read a lot of manuscripts, and the reason they ask for a standard format is that it frees them to concentrate on the content. If, instead, they start their reading session cursing you out because you haven’t followed instructions, you are starting from a negative position in terms of earning enough points with them to get a deal. You, on the other hand, are probably only working on a few manuscripts at a time. So you spend the minute it takes to reformat. Consider it as doing a favor for the editor. Use my manuscript formatting guide as a template. You can also check out the latest edition of Formatting & Submitting Your Manuscript from Writer’s Digest Books. Format matters to agents and editors not only because the standard format is easy to read, but also because if you submit your manuscript in the standard format, they know you are a professional who has taken the time to learn the industry standard. This entry was posted in Editing and tagged Edit Like A Pro, Elements of Fiction, Manuscript Mechanics.